These pictures were taken at the Skagit Valley Tulip Festival at Washington last spring. However I am not sure what type of tulip is this. If you know its name please let me know. Thank you for visiting this and leaving your comment. What a contrast of beautiful colors! Thank You! It was a warm sunny day and I had fun clicking pictures. 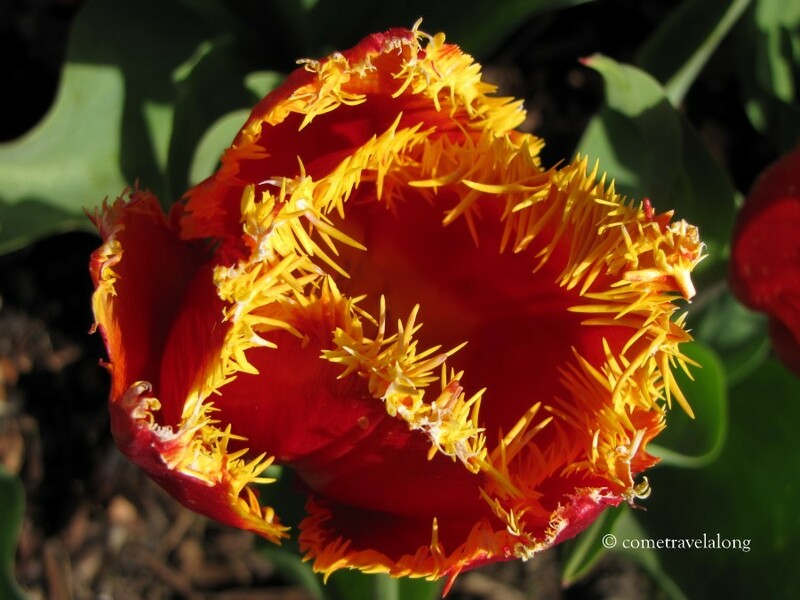 I’ve never seen a tulip like that before – gorgeous! Ooh that’s a beautiful one, Ruchi! I’ve never seen one like this, though. Thank You Anita! Yes, its strange with those spikes. Such a crazy looking tulip. I’ve never seen anything like it! Very beautiful though. Thank you so much for sharing. Well, would you look at this superb shot. Don’t tulips make wonderful photography subjects, but I’ve not idea what it’s called. I bought some of these last year, they were great and I have them coming back again this year. The sticker on the pot calls them Fabio. Hope you find some they are stunning!